Sometimes, the boss comes long ways to check in on his people. 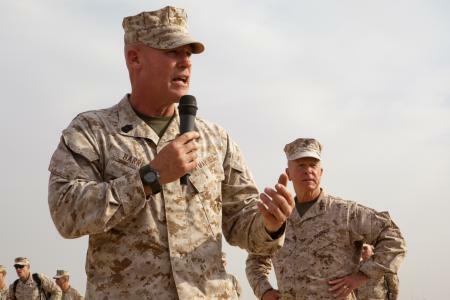 That was the case yesterday in Afghanistan, where Commandant Gen. Jim Amos and Sergeant Major of the Marine Corps Mike Barrett dropped in on six bases and outposts, fielding questions from Marines and thanking them for their service. There are at least two accounts of their travels published. A Marine Corps news release said the brass visited Marines at Camp Leatherneck, Forward Operating Base Payne, FOB Geronimo, FOB Jackson, FOB Zeebrugge and Combat Outpost Shir Ghazi. That means they traveled from Kajaki district in northern Helmand all the way down to some of the southernmost positions the Corps has there. At COP Shir Ghazi in Musa Qala district, Amos presented a Purple Heart to Sgt. Shane Fredericks, an infantryman with 2nd Battalion, 5th Marines, who sustained a traumatic brain injury after his vehicle struck and improvised explosive device. A report by embedded journalist Gretal Kovach said the blast occurred May 12 in Now Zad district, and was generated by 120 pounds of explosives. “You’re not going to overindulge and then jump on a crotch rocket and slam into a stinkin’ telephone pole,” Barrett said. No mincing words there, right?